I know it’s in all the tourist books, but still … we had guests visiting over the weekend and wanted to show them a real Vienna coffee house. Homemade cakes. Good solid food. Plenty of newspapers. Music on Sunday afternoons. And, now, no smoking! 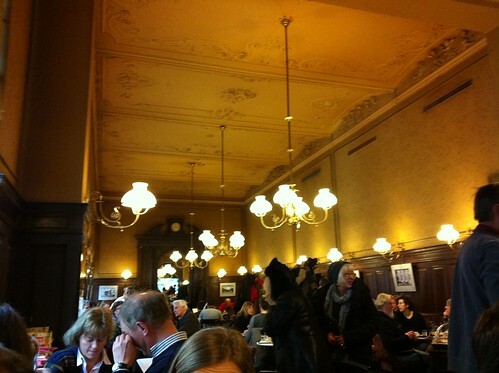 I took the advice of a recent Independent Column (Graham Greene’s Vienna) – thanks Gavin Plumley – and had my first Fiaker (coffee with schnaps). Even though we had just had a huge brunch we “forced” our friends to have cake (chocolate truffle cake and topfen torte) while we enjoyed our coffee. As the top photo shows … the coffee is comes fast-often more quickly than that horrible self-service system used in places like Starbucks. I am pretty sure our 7 different kinds of coffee, each with its own water and balancing spoon, arrived within three minutes of ordering … I have stood around longer for a short latte. Come visit Vienna while places like Sperl still exist! It’s even better in the summer when you can sit outside on the large shaded square in front. 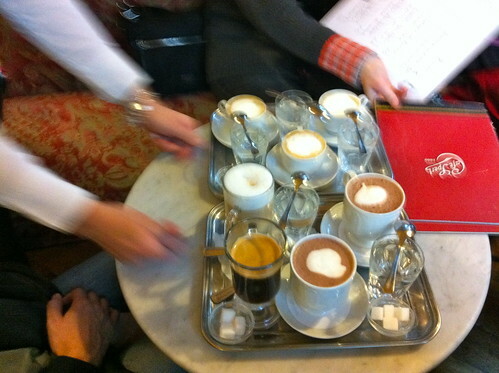 For more about Vienna and especially coffee in Vienna check out Merisi’s Vienna For Beginners … a truly beautiful blog. Thank you, Andy, for mentioning my coffee-splattered blog! So good to read that Sperl is smokefree, after all (I had heard that they would be grandfathered, keeping the “right” to smoke in there). Thank you for the recent Ljubljana post! I have not managed yet to get there, but it is on my list. There are so many beautiful places around here. the last thing I would have expected to find here, is a picture of the Washington Dulles airport mobile lounge! Gave me a jolt to see it, with a pang of homesickness (I moved here from DC). And you are right, the walk to the new C/D Concourse would need a lounge system or at least some “mobile carpet”.